A groundbreaking guide to making profitable business decisions. Do you wonder why your value initiatives aren’t providing the payoff you’d hoped for? Could it be because you’ve been thinking about value all wrong? According to the authors of this groundbreaking guide, there’s a very good chance that you have. Using examples from leading companies worldwide, they explain why every decision a company makes either creates value or detracts from it, and why, if they hope to survive and thrive in today’s increasingly competitive global marketplace, company leaders must make value-creation the centrepiece of every business decision. 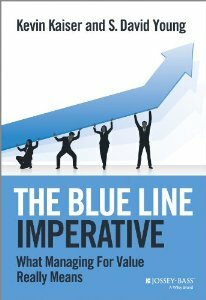 Authors Kaiser and Young have dubbed this approach “Blue-Line Management,” (BLM), and in this entertaining, highly accessible book, they delineate BLM principles and practices and show you how to implement them in your company.